“Exploring Mobility”—as a pioneer in mobility for digital applications, this is what the Pepperl+Fuchs brand ecom stands for. What began with the first tablet series for hazardous-area applications is now even more future-oriented. Besides tried-and-tested functions, the Tab-Ex® 02 also comes with innovative features like augmented reality that make Industry 4.0/IIoT applications easy to implement. Pepperl+Fuchs’ comprehensive portfolio of industrial sensors and Ex equipment and ecom’s expertise in mobile devices combine to offer sophisticated solutions for Mobile Workers. These synergies open up completely new, innovative applications and harmonized overall solutions that provide our customers with an essential competitive edge when it comes to Industry 4.0. Besides tried-and-tested product features, the Tab-Ex® 02 comes with a variety of innovative functions, making digital applications mobile beyond company boundaries. This lays the groundwork for countless Industry 4.0 applications. Whether as a rugged version for harsh industrial environments or an Ex model for global use in Zone 2/Division 2 and Zone 1/Division 1, the Tab-Ex® 02 stands out due to maximum performance and uncompromising safety in hazardous areas. The combination of powerful software and connectivity to higher-level systems is the ideal solution for complex applications—paving the way for IIoT applications. Tab-Ex® 02 simplifies Mobile Workers’ day-to-day activities by making live data, digital photos, videos, and video streaming possible any time and anywhere. The integration of augmented reality applications and connectivity to higher-level information Systems combines virtual and real process data and makes your system transparent. This not only provides information about device status and process data, but it can also identify the appropriate system equipment, preventing malfunctions. 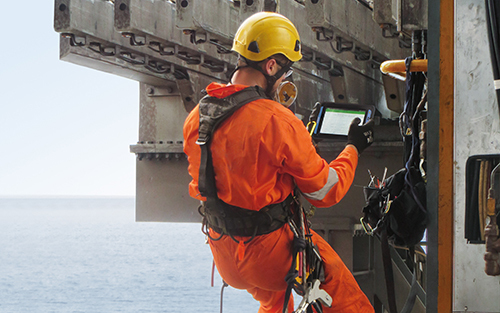 Whether for navigation through the plant or for maintenance—processes become safer, more user-friendly, and more efficient. Processes and related information are no longer simply visible, but are superimposed directly on the display—without any navigation whatsoever. This enables real-time maintenance. Users can access maintenance cycles and corresponding documentation on-site. Predictive maintenance is also possible, as deviations in the measured values are identified ad fixed automatically. System shutdown and startup procedures involve sensitive and time-critical processes with numerous coordinated activities. Tab-Ex® 02 offers support with augmented reality-based applications: error-free shutdown and startup procedures can be carried out quickly and efficiently with standardized support. Due to increasing complexity, asset management is gaining more and more importance—especially for companies with multiple sites and numerous sales representatives. In combination with the right apps, organizations can benefit from increases in efficiency and productivity. 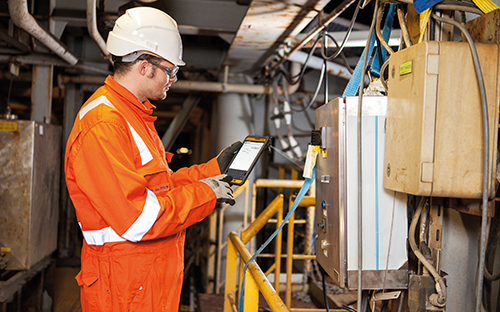 The new Tab-Ex® 02 tablet for ATEX Zone 1 from ecom, a Pepperl+Fuchs brand, has a wide variety of applications, such as work order management, predictive maintenance, and augmented reality in hazardous areas and in harsh environments. The Tab-Ex 02 helps securely and efficiently meet the current and future communication requirements of Industry 4.0 and the Industrial Internet of Things, even in mobile applications and hazardous areas. Improved processing power, increased security, optimized image quality, and easier operation: the new Tab-Ex® 02 series features a range of functions that expand mobility in existing and future applications. Models for harsh environments and for Zone 2/Div. 2, and now also for Zone 1/Div. 1 are available. An interlinked solution based around the networked Mobile Worker is decisive for successful digitalization of applications with the help of mobile devices. ecom offers total solutions, including partners for software solutions, installation, and SLAs (service level agreements), as well as an extensive app library to ensure the implementation of such concepts is as easy, reliable, and secure as possible. With the addition of ecom, Pepperl+Fuchs gained a highly specialized team member that has been firmly established in the industrial market for decades—as a global market leader for mobile industrial equipment in hazardous areas. Solutions for mobile security and communication ensure that customer applications can be digitalized quickly and easily. This opens up completely new possibilities and enhances the safety, efficiency, and transparency of operations. It is also an ideal foundation for Industry 4.0/IIoT applications. 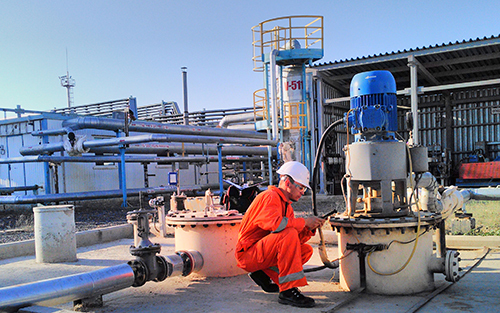 The name Pepperl+Fuchs has been synonymous with high-quality products, services, and solutions for process systems in hazardous and industrial environments for over 70 years. As a firmly established partner to the process industry, the umbrella brand of Pepperl+Fuchs incorporates a wide range of industrial sensors and Ex equipment that complements ecom’s mobile solutions at an infrastructure level. These synergies open up completely new, innovative applications and harmonized overall solutions that provide our customers with an essential competitive edge when it comes to Industry 4.0. Do you have questions about the Tab-Ex® 02? Do you want to receive more information? We are happy to help! Simply fill out the contact form to send us a message.